By Chris Maupin As coral reefs come under threat from a variety of different factors, something that may amaze the reefkeeping community is that corals are recording their own plight with respect to climate change impacts. Not only that, they have recognizably recorded the climate conditions in which they have grown since they began producing carbonate skeletons. 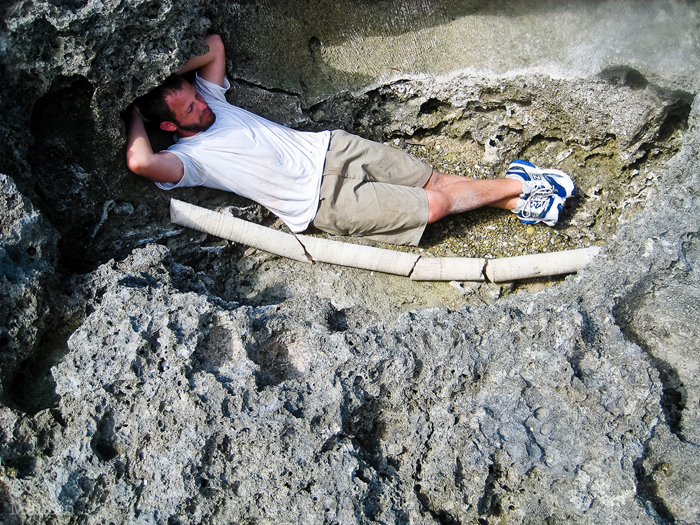 Paleoclimate scientists have developed tools and methods to extract this information and reconstruct how climate has changed and varied in the tropics. Reef aquarists have a sense of the importance of tropical oceans, especially as it pertains to coral reefs. They are the backbones of an enormous economy based on tourism and fisheries. However, the coral reef regions are also tremendously important to the global climate system, and therefore an incredibly important region for climate scientists to study and attempt to understand. They are the heat engine for Earth’s climate system. The extremely warm water present in tropical surface ocean regions like the West Pacific Warm Pool produces the deep convection that releases heat into the atmosphere, allowing it to be redistributed to higher latitudes. The tropical oceans are also the home of the major forms of year-to-year climate variability on Earth. The largest form by far is the El Niño-Southern Oscillation (ENSO), where there are two primary “phases”, a “warm phase” (El Niño), where anomalously relaxed tradewinds in the tropical Pacific Ocean allow warm waters to the west to “slosh” across the Pacific along the equator and stop upwelling off the western coast of South America. The resulting weakened sea surface temperature gradient across the Pacific, and warm water to the east of where it would normally be causes deep convection to form near the dateline, reinforcing the weakened or reversed tradewinds and sustaining the event throughout the winter, until the spring warming of the Northern Hemisphere. The “cool phase” (La Niña) events are fundamentally the opposite: tradewinds strengthen and produce stronger upwelling in the eastern tropical Pacific and more convection and rainfall in the western tropical Pacific. These opposing events tend to happen every 2-7 years. This sloshing of warm water wreaks global havoc with weather patterns, not just those in the tropical Pacific. Monsoons can fail, massive fires can erupt, devastating crop failures occur, flooding, etc. etc. In some remote tropical Pacific areas, the entire freshwater tables of some island chains tends to disappear. And then there are of course the impacts to our beloved coral reefs. Many will remember the massive bleaching events caused by anomalously high sea surface temperatures caused by the catastrophic 1997/98 warm event. This should crystallize in your mind why we would want to understand ENSO as best we can. Can we predict it? How does it change? Why does it change? Can anthropogenic warming make it change? For example, from 1920-1960, there were almost no ENSO events. Then, in the 1970’s, ENSO events began to become strong and very frequent. No one knows why this happened or what caused it. How does it work? So by now you’re probably asking yourself, how can we extract such information from something as simple as a coral? The answer lies within the skeleton. As every coral aquarist knows, the skeletons of scleractinian corals are composed of calcium carbonate (CaCO3) in the crystal form of aragonite. It turns out there are multiple types, or isotopes, of oxygen. Reach back in time to your last chemistry class and recall that chemical elements are defined by the number of protons within their nuclei. However, one element may have varying numbers of neutrons. These elements with different neutrons are called isotopes. Now stay with me, there are radioactive isotopes, which you may be most familiar with, but there are also stable isotopes, which do not decay and release energy. Oxygen has three stable isotopes, the most common being 16O, making up 99.76% of all the oxygen atoms on earth. The “16” refers to the mass number of the atom, or the sum of protons and neutrons in the nucleus. The second most abundant form is 18O (0.201% of Earth’s oxygen). As you may surmise, since it’s still oxygen, it didn’t gain two protons, so it must have gained two neutrons. Since these two isotopes are by far the most abundant, they are also the most useful since we can measure their ratios more easily. Now what happens to these isotopes when the oxygen in a carbonate ion in the ocean becomes a carbonate ion in a coral skeleton? Most carbonate (CO32-) ions will be composed of the following isotopes: C16O16O16O But, there are also more rare carbonate ions that contain one of the heavy oxygen isotopes: C18O16O16O Well, thermodynamics tells us that it is energetically favorable for the skeleton to get a heavier oxygen isotope ratio relative to the ratio of oxygen atoms of the free carbonate ions. In other words, the carbonate ions containing a heavy oxygen have a “preference” for being in the skeleton. The degree to which the skeleton “prefers” a heavier carbonate ion depends on the temperature at which the carbonate ions are being put from into the calcium carbonate lattice. At cooler temperatures, the skeleton “wants” more heavy carbonates, and at higher temperatures, it “wants” less. So this brings us to the point: the ratio of stable oxygen isotopes within a coral’s skeleton is controlled by the temperature at which the coral precipitated its skeleton, and the ratio of oxygen isotopes in the seawater from which the coral precipitated its skeleton from. All right, the first one is pretty intuitive: cool, we can tell what sea surface temperatures were! You may be scratching your head a bit about the second point, though. What information is to be gained by knowing the ratio of isotopes in seawater? Well, the answer is salinity. The same processes (evaporation and precipitation balances) that control salinity in the tropical oceans also control the oxygen isotopic ratio of the surface oceans. That’s because lighter isotopes are more easily evaporated, so as the water gets saltier, by the same token, it also contains less of the lighter oxygen. Now a clear picture should emerge: by measuring the ratio of the two discussed oxygen isotopes in a coral skeleton, we reveal the salinity and temperature at which it was growing. The ENSO system is probably the best example on earth of how this works. Take a coral from the west Pacific: during an El Niño, the west gets cooler, drier, and more saline, since all that warm water and rainfall has moved to the east. The combination of these factors means there will be more of the heavier, rare oxygen isotope incorporated in the coral’s skeleton. Exactly the opposite will happen in the central and eastern tropical Pacific, where the warm water and rainy, less saline conditions will cause less of the rare oxygen isotope to be incorporated. What corals do we use? Stony corals, as reef aquarists well know, come in a dizzying array of sizes, shapes, colors and growth rates. We consider several things when we select a type of coral for climate reconstruction. Firstly, the coral has to be continuously growing. It also needs to be long-lived and contain some means of providing age control. As it turns out, massive Porites spp. colonies tend to fit the bill perfectly. They can live for hundreds of years; they grow continuously throughout the year, and produce annual couplets of high and low density bands. 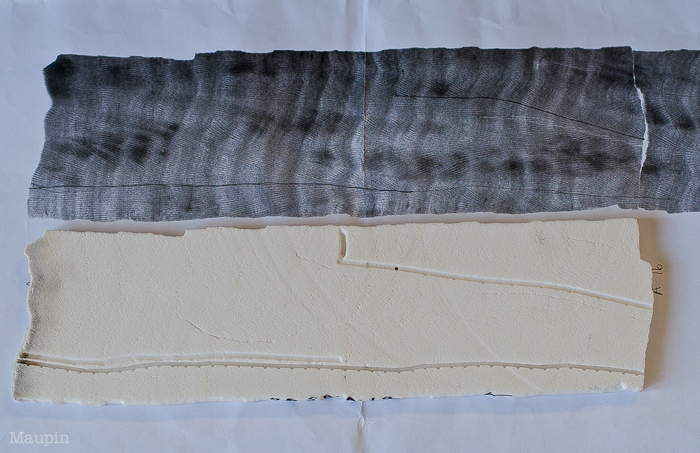 These density bands are revealed by X-radiograph images of the coral samples, and provide an analog to well-known absolute dating by tree ring counting. This provides incredibly robust time control. Potential issues arise however in the lifespan of these massive Porites spp, they tend to only live for a hundred years or so on average (as mentioned above, they can live for hundreds of years, but this is exceptional). So, we can turn to slower growing massive corals like Diploastrea heliopora, where some LIVING specimens have been documented to be over a millennium old! Both Porites and Diploastrea are present in the hobby, and if you cultivate them, think of them as nature’s log for the conditions in your aquarium! In fact, some groups do use aquarium culture to try to understand the minute details of the capabilities of these species to be climate scribes. How do we do it? 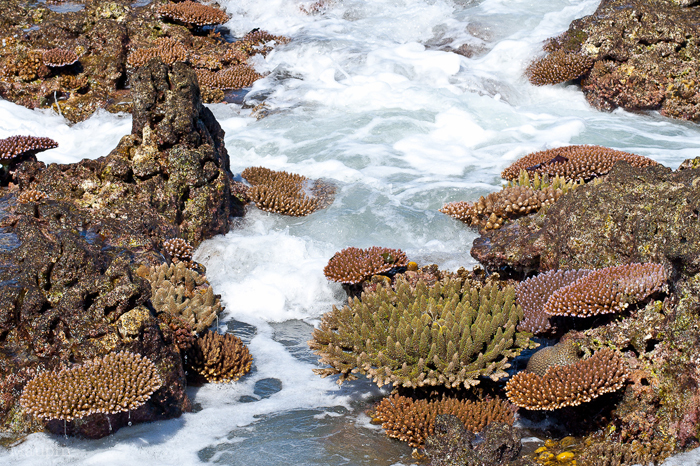 Well, it all starts how you might think it would start: exotic fieldwork to locations where such corals grow, and where the climate signal would be the strongest. When a suitable colony is located, a core is taken along the main growth axis of a colony. The cores are usually 4-6” in diameter. In the case of live corals, a plug fashioned of either epoxy or concrete is used to seal the drill hole, and the corals rapidly grow back over the damaged area. 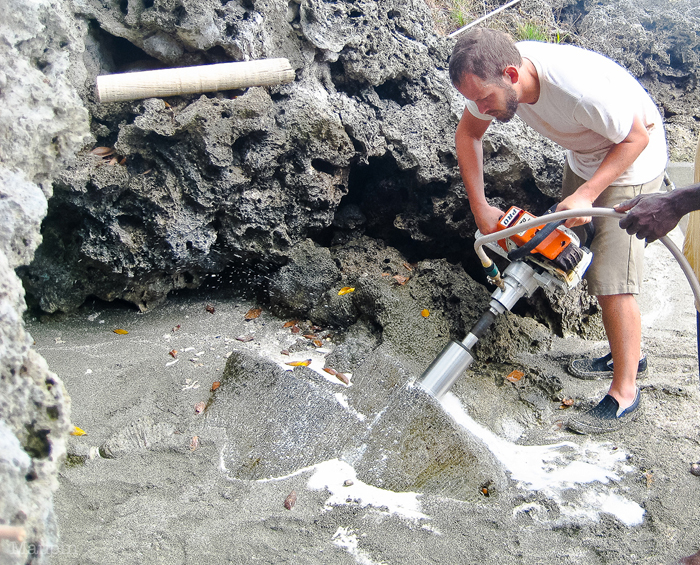 We can also core fossil coral colonies that have been uplifted tectonically using a specialized chainsaw motor fitted with a coring gearbox and barrel. Radiometric dating allows us to put accurate dates to such fossil samples and reconstruct climate variability much older than the oldest living corals. This all sounds exotic and exciting, and despite the backbreaking work it can require, it really is. But, this is only the first short step in an extremely long process. Once the cores have returned to the laboratory for analysis, they have to be cataloged, slabbed and, in the case of fossil corals, dated. Once suitable samples are identified; that is, samples from the period of interest which lack diagenetic alteration, boring organisms, breaks, discontinuities, dissolution, or growth direction changes, their slabs are x-rayed to reveal banding. We can then determine how long the record will be and the growth rate of the coral. Once we know these things, we begin to mill tiny, tiny samples of carbonate powder from the skeleton using a computer-controlled microsampler. We can sample corals at a resolution that yields 12 samples within a couplet of density bands. That means we can generate MONTHLY resolved records of climate change and variability over the entire lifetime of a given coral sample! The mass of these milled samples usually range from ~50-200 MILLIONTHS of a gram, and these tiny samples will be what we analyze for isotope ratios. These samples are reacted with hot phosphoric acid, releasing CO2 and H2O gases, which are both frozen at -196C using liquid nitrogen. As you may guess, this CO2 gas contains the oxygen atoms that were in the carbonate, and they are what we want to measure, so we need to purify them from the water vapor. The frozen gases are heated to -110C. At this temperature, water vapor remains frozen, but CO2 is again a gas. This pure, free CO2 is frozen in a “trap”, again using liquid nitrogen, isolated from the water vapor. 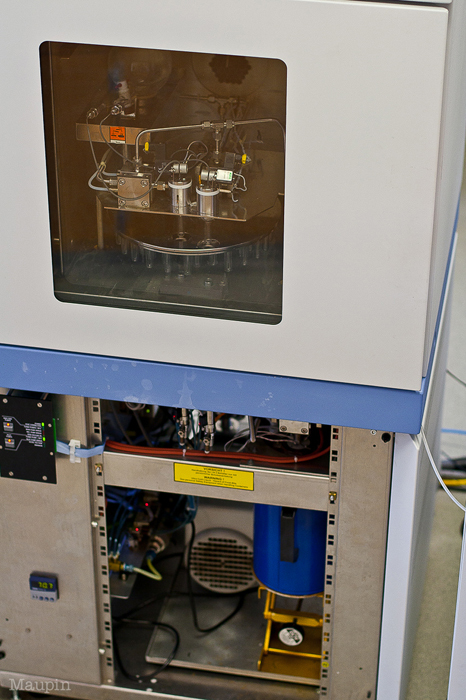 This trapped, purified CO2 is heated to a gas state where it is introduced into the source of a highly specialized isotope ratio mass spectrometer. 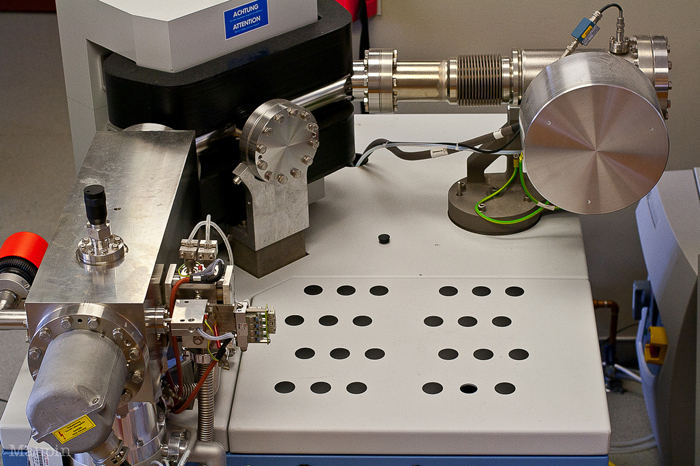 Within this specialized mass spectrometer, the CO2 collides with an electrified cathode and becomes ionized. It is accelerated into a flight tube by a sudden voltage difference of 10,000 volts! Halfway through the flight tube, the path of these flying CO2 ions becomes bent by a magnetic field. Now remember, some of these CO2 ions will have more mass because of an 18O substituting for a 16O. Imagine the heavier CO2 as a semi truck, and the lighter, more common CO2 as a sports car. Both are traveling down the highway at the same speed, side by side, but suddenly they both have to turn right. The sports car is obviously going to have a tighter turning radius, while the truck has a much wider turning radius, so after the turn is complete, the car and the truck will end up at very different places, the same goes for the two differently massed CO2 ions. After this turn, the different CO2 ions are now separated by their mass, and strike “collectors” that are placed where the different CO2 ions should end up after their turn. Each ion strike generates a current, and a measured voltage is proportional to ion abundance. In this way, we measure the ratio of 18O to 16O in a given sample. In Summary The knowledge of how isotopes behave in coral skeletons gives us the power to elucidate what changes corals are used to and have adapted to in the past, and, by the same token, what kind of changes we may be able to expect in the future. This article was inspired by the concern of environmentally minded hobbyists who have expressed curiosity as to how scientists go about understanding one of the major threats reefs now face: climate change. Ultimately, it’s poetic that it is the corals themselves that are the tools that may provide the clues on what they have experienced and which await them in terms of environmental variability resulting from climate change. Beyond that, instead of us saving the corals, it may actually be the corals that save us humans through the information they reveal about the types of climate change and variability that can take a devastating toll on society and human life.